There’s nothing like taking your makeup off after a long day! Clinique makes it all too easy with their hydrating Take The Day Off Cleansing Oil. It’s a lightweight creamy oil with a luxurious feel that’s not too heavy. Making it perfect for all skin types. Even oily! I absolutely love this stuff because it makes removing my makeup incredibly simple. With dry hands, I massage 2 pumps of Take The Day Off Cleansing Oil into my skin to break down my makeup. This stuff breaks down even the most stubborn of waterproof makeup in seconds without a ton of scrubbing. Then it transforms into a milky cleanser that leaves your skin feeling clean without that tight, dry feeling. It even works great with other cleansers for Double Cleansing. The Clinique Take The Day Off Cleansing Oil is definitely holy grail status! Hydrating cleansers don’t always get the job done thoroughly. Leaving behind a ton of dirt and makeup after cleansing. Not Derma E though! The Derma E Hydrating Cleanser is both gentle and effective. It’s a lightweight gel cleanser with a gentle foaming action that really breaks down makeup and grime without leaving my skin feeling stripped. 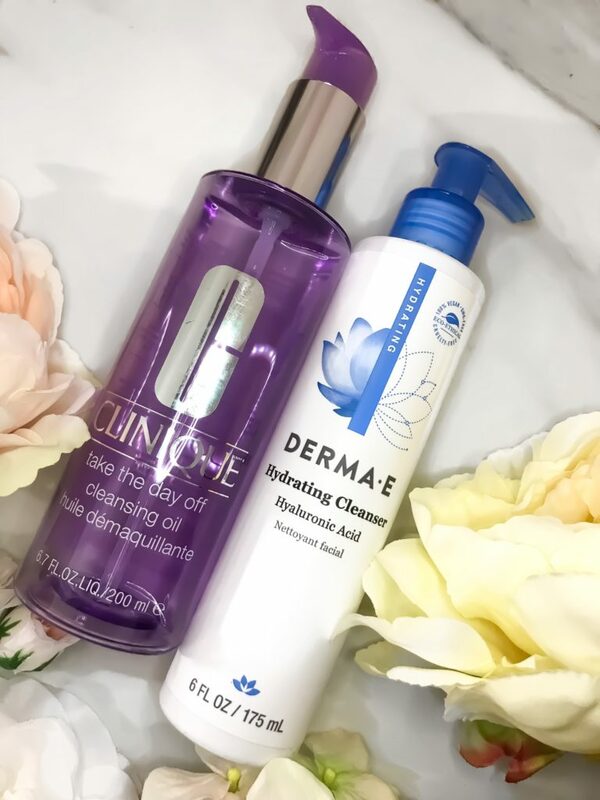 The Derma E Hydrating Cleanser is one of the few hydrating cleansers I’ve tried that didn’t leave my skin still relatively dirty after cleansing. You can’t beat that for under $20! Sunscreen wasn’t always a part of my skincare routine. Now I can’t live without it! The Dior One Essential City Defense SPF 50 is hands down the best sunscreen I’ve ever tried. Most sunscreens have a funny chemical smell (almost like a swimming pool) or they’re too thick and greasy. Dior got it right, though! The One Essential City Defense SPF 50 has a light, watery texture that absorbs quickly and easy without leaving a greasy film or ashy white cast. The best part? It feels like silk and has a subtle rose scent that smells so good. The One Essential City Defense SPF 50 is rather expensive at 60 bucks. But, of course, it’s the most luxury sunscreen on the market! People ask me all the time how I keep my skin so clear. Proper cleansing and masking is how! I slathered on the Peter Thomas Roth Irish Moor Mud Purifying Black Mask on almost every week in 2017 to keep my skin clear. The Irish Moor Mud Purifying Black Mask detoxifies the skin removing dirt, environmental pollution, makeup and more from your pores. The result? Smooth, glowing skin that feels supple and incredibly clean. You can consider this one of my secret weapon for keeping blemishes away. I’m a huge fan of Peter Thomas Roth in case you haven’t noticed. His products are absolutely fantastic and work incredibly well. My all time favorite face mask is his Cucumber Gel Mask. I’ve been using this stuff for so long that I’ve lost count of how many jars I’ve gone through. The Peter Thomas Roth Cucumber Gel Mask is a cooling, soothing hydrating gel mask that’s perfect for dry, sensitive skin. It instantly soothes skin on contact providing immediate comfort and hydration. There were many nights I went to bed with this stuff to prevent flakes and get rid of blemishes before they fully bloom. This stuff is gold for dry skin! You’d probably think I was lying if I told you perfect skin was only a pump away. But I’m not! The Dior Capture Totale Dream Skin Perfect Skin Creator tackles pretty much any skin concern you toss at it. Large pores? Minimized and blurred. Uneven texture? Instantly smoothed. Fine lines? Plumped and ready to go. Redness? What redness? The DreamSkin Perfect Skin Creator is an intense anti-aging formula that’s very versatile. It’s designed to be the last step of your skincare routine. Making it one hell of a luxury makeup primer. Or luxury anti-aging serum you can slip on after cleansing for smooth, even skin out the gate. The Dior DreamSkin Perfect Skin Creator is also very expensive but worth every penny if you want smooth, Instagram-selfie worthy skin! This $6 facial spray has been all over Instagram all 2017. I totally see why! TJ Maxx’s PearlEssence Coconut Rose Hydrating Face Mist is wonderful treat that my dry skin can’t get enough of. The Coconut Rose Hydrating Face Mist is very fine and lightweight so it absorbs quickly without leaving that dripping wet feeling. It’s very hydrating and makes my skin look so luminous and radiant. Sometimes I use it as a toner spritzing a little on after cleansing to refresh and hydrate before applying my skincare. Or after my moisturizer to give me a little boost if I’m wearing a matte foundation or want a little extra glow. I even use it as a setting spray for my makeup to set my skin off nicely and make my highlight pop even more. Tinted moisturizers aren’t usually my thing. But I found myself absolutely addicted to the new Philosophy Renewed Hope in a Jar Skin Tint. This stuff has saved my life many early mornings! The Philosophy Renewed Hope in a Jar Skin Tint is a hydrating moisturizer (duh) with a lightweight creamy texture and slight tint that easily evens your skin. I relied heavily on the Renewed Hope in a Jar Skin Tint for months because it allowed me to knockout my skincare and foundation all in one step. And with my fingers. You can beat that efficiency! This stuff shaves so much time off of my morning routine that it’s earned a special place on my vanity. The Philosophy Renewed Hope in a Jar Skin Tint is truly a lifesaver! There’s nothing like waking up with smooth, hydrated skin! The Philosophy Renewed Hope in a Jar Overnight Recharging & Refining Moisturizer was also a huge hit for me this year. This will probably always be my holy grail night cream because it’s so much more than your typical moisturizer. The Renewed Hope in a Jar Overnight Recharging & Refining Moisturizer is formulated with AHAs like glycolic acid to help gently exfoliate while you sleep. So my skin feels so soft, supple and smooth in the morning. Like butter! I love to glow so it shouldn’t come as a shock that I’ve polished off 2 bottles of this glistening serum. The BareMinerals Brilliant Future Age Defense & Renew Serum is a new formula designed to hydrate, brighten and fight off pesky signs of aging including fine lines and dullness. Right up my alley! The Brilliant Future Age Defense & Renew Serum is lightly hydrating and gives my skin the most wonderful natural luminous glow that’s so stunning. You’d think I’d already dipped my face in illuminator with this serum. I normally like to switch things up a bit but the BareMinerals Age Defense & Renew Serum works so well that I keep repurchasing. It’s that good! Don’t you love when an entire line works for you? That’s how the BareMinerals Brilliant Future Age Defense & Renew line turned out for me. The serum works wonders and the eye cream is wonderful too! It’s also a brightening, hydrating formula so it’s perfect for my thirsty dry eyes and pesky fine lines that need a little extra pampering. I’ve been loving this eye cream because it’s nice and rich providing enough moisture on even my driest days. Plus, it works like a charm around my mouth too to tackle my annoying fine lines and give them a little extra (but much needed!) hydration. The BareMinerals Brilliant Future Age Defense & Renew Eye Cream is one of the most solid eye creams I’ve ever tried! The Kate Somerville ExfoliKate Glow Moisturizer is another moisturizer that I was utterly obsessed with this year. It’s pretty much like the day version of the Philosophy overnight cream. Except more hydrating with a way more lush feel. This moisturizer feels so good! The ExfoliKate Glow Moisturizer is a rich, deeply hydrating cream with glycolic acid that keeps your skin flawless all day long as it gently exfoliates. Dead skin doesn’t stand a chance with this stuff! I swore by it all summer and fall because it gave me a little extra leg room to slack off with masking. The Kate Somerville ExfoliKate Glow Moisturizer is a must have for beauties who like smooth, clear radiant skin! What were some of your favorite skincare products last year?